Tired of students asking for a grade change for no particular reason -- other than a non-A might ruin their holiday? Clemson University ’s English department has an idea. Rather, it has a template. 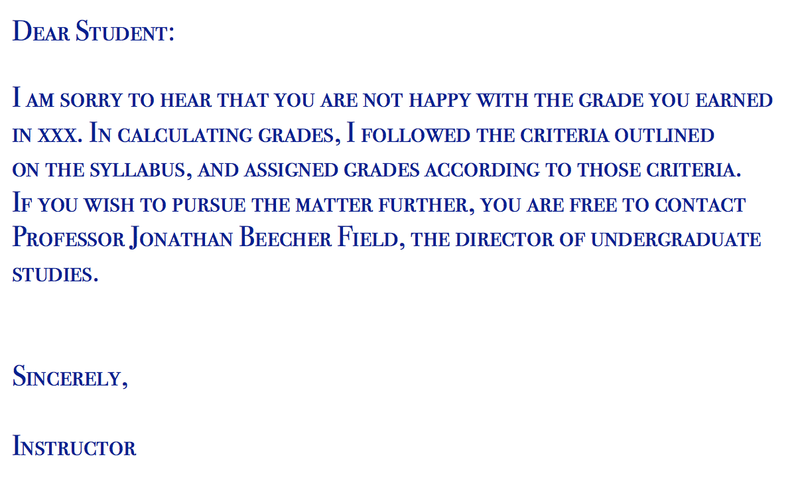 Field included the following template for instructors to use with students asking for or demanding a final grade change. Field’s tradition has been continued by the department’s current director of undergraduate studies, Walt Hunter, assistant professor of English, who sends out a nearly identical email (his template says students also may contact the associate chair). Horror stories about students demanding better grades certainly exist, but neither Field nor Hunter had any to share this week (both said they were relatively rare). Instead, Field said he was more inspired to write his original email by empathy for non-tenure-track professors. Across academe, these professors’ future course assignments are most reliant on positive student feedback (a major criticism of standard student evaluations of teaching ). So they’re therefore more vulnerable to student complaints about grades. They’re also more likely to feel like they don't have departmental support. Chris Blattman, Ramalee E. Pearson Professor of Global Conflict Studies at the University of Chicago, has policy-like statements about his approach to Ph.D. advising  and whether or not he’ll write you a letter of recommendation and more on his impeccably organized website . But he said Wednesday that he’d never received guidance from any department he’s taught in on handling regrade requests. They're free to ask. I correct clerical errors. If they want regrading it's with fresh eyes, with the understanding the new grade could be higher or lower. Yes, but like @familyunequal  I let them know their grade could go down when I reconsider. I'd add that I'm hardly ever asked. Also, in a twenty year career, I doubt I've made an adjustment up or down more than a few times. Yes. They have a right to make an argument. And we have to be able to rationally defend the grades we give based on course objectives. That being said, grade changes are rare. I’ve been known to make a math error now and then, but I’m otherwise careful about the grades I give. Diascro mused as to whether certain kind of institutions see more requests, namely private versus public. In her own experience, she’s had “loads” of grade requests in certain jobs and few to none in others. That said, Diascro added that she’s “pleasantly surprised” at how receptive students are to her arguments about fairness, and that most just seem to want to make sure they’re being treated fairly.